Gecko’s ongoing research and development places it at the forefront of the industry. 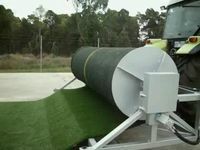 Our determination to develop new grass yarns and methods ultimately provides the market with better systems, products and greater value for money. Gecko’s unique patent pending hydraulic system makes OH&S issues with cricket pitch covers a thing of the past. Ideal for balconies, patio areas and also trade shows, Gecko’s tile mat offers a point of difference to exhibitors. A solid product that eminates a natural or green focus, this product ensures that your display remains fresh and attractive for the duration of the show.